Its performance gains may be modest, but the Core i7-6700K is definitely exciting on the overclocking front. First the bad news. The all-new Intel Core i7-6700K – which pitches in at around $350 (about £225, or AU$475) – does not tear PC gaming a new one. It's not a render monster like none before. It doesn't take desktop number crunching to a whole new level. Bummer. Instead, it's yet another Intel processor with four cores, eight threads and a habit of humming along at about 4GHz. Isn't that what Intel's top processors for its mainstream platforms have looked like forever? In fact, it's the way things have been since the arrival of Sandy Bridge back in late 2010. Of course, we've been complaining about the glacial rate of progress at Intel for so long, you might expect this latest mediocrity to have us pondering the possibility of putting an end to it all by stringing ourselves up with SATA cables. After all, you could say the glacial progress comment is actually a bit kind. Intel has in fact backtracked in recent years courtesy of silliness like dumbed down chip packaging and cooling, along with overclocking that's ever more locked down. So it's true, we're not exactly blown away by this new chip itself. And yet it's still the most exciting mainstream Intel CPU for years. How so? Let's start with the basics, even if they are a bit boring. 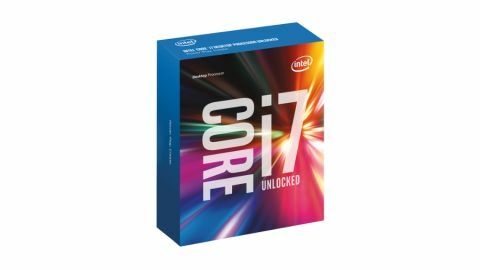 The 6700K is one of two launch chips representing the new Skylake family of 14nm CPUs – the other is the Core i5-6600K. This i7 and its quartet of unlocked Hyperthreaded cores rocks in at 4GHz nominally with a 4.2GHz Turbo clock. Yup, just 200MHz worth of Turbo boost. Why even bother? Anyway, it slots into the new LGA1151 socket and thereby hooks into Intel's new 100-series chipsets, the most notable of which for us performance junkies is the Z170, which effectively replaces the old Z97. Graphics-wise, there's an Intel HD Graphics 530 core onboard, and thus not one of the fancy new Iris or Iris Pro solutions. Got that? Whatever, Skylake is a 'Tock' in Intel's Tick-Tock chip development parlance and that means it's supposedly an all-new processor design on an existing production node, in this case 14nm. Except we've barely seen any of the first 14nm chips, known as Broadwell, on the desktop and now Skylake is go for launch. Put simply, Intel's CPU roadmap has gone completely out of whack. The other problem, when it comes to improving CPU performance, is that Intel's CPU engineers snaffled up all the low hanging fruit long ago. Then they climbed the branches and grabbed everything else. And now there's almost nothing left. Intel's CPU cores are outrageously optimised. All this explains why our above benchmark results show such a modest uptick in raw CPU performance. It's all of 4% faster than the existing Core i7-4970K in Cinebench. Bleh. As for video encoding, you're looking at a 6% leap. Hardly exciting. The game benchmarks are arguably even less dramatic. At the kinds of resolutions that a fairly pricey chip like this is likely to find itself operating, the impact of the 6700K is slim going on none. If you've got a fast Intel Haswell processor or an Ivy Bridge chip, hell maybe even a Sandy Bridge chip, you probably won't feel much subjective difference with Skylake. It's just not a big enough step forward. We even found that the weirdo chip that is the Broadwell Core i7-5775C has the edge in some game benchmarks, and that's probably thanks to the 128MB of eDRAM, something the new Skylake Ks lack.